You can probably age certain businesses too by the predominance of various IT infrastructure. 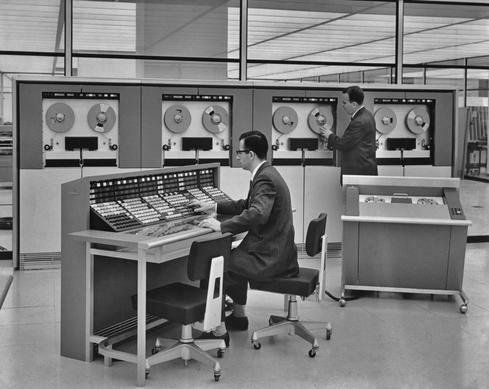 Let’s face it you wouldn’t have built Uber with a mainframe. IT in commercial companies exists to support the business and has long been criticized for a slow response in many organisations. By the time the projects have been delivered the business has moved on or been held back because of the time it takes to react. Of course, all businesses are looking for agility (Agile being yet another buzzword!). Businesses that can ‘turn on a dime’. React to markets and capitalize quickly is the Utopia of many a boardroom. So often, the infrastructure and existing systems are the ball and chain around the ankle of the business. Scrapping the old systems to largely re-write it in a different architecture is commercial nonsense too and in any event, aren’t we just building another legacy? Sure loosely coupled architectures are much more adaptable and one would hope, future proof. But what about the DevOps automation? Have we learnt the lessons of the past? Anyone remember 1999? The talk then was about the impending doom of the Year 2000 and all those systems that only had a two digit year field and how we were all going to die. Of course it didn’t happen but several organisations spent millions making sure it didn’t. We also discovered that very few people understood how these systems worked. People were not confident as to what would happen if they changed things that had been working for years, largely unnoticed. Let’s go on a mind excursion to the future – not too far away, not flying cars but hopefully more usable electric ones. All this DevOps automation that people have been building – Is it going to be like the code of the 1970’s? Scripts that no-one has a clue what happens if you change it. DevOps engineers had been scripting away in 2017 building grand DevOps automation schemes, that over the years have had personnel changes, emergency fixes, lost documentation and here we are now with a legacy that is holding back the agility of our business. Back in the present day we are already seeing a shortage of people skilled in this knowledge. Great for the people with the skills as their rates go up but bad for business. The Application Release Automation market is split into three main group in my opinion. The Open Source, script heavy group at one end and the flexible, process driven, Enterprise scale tools at the other that require big budgets and big implementation projects. In the mid ground there is MidVision, who provides a tool to effectively automate the releases of applications without the need for scripting but also without the need for huge budgets and large implementation projects. Oh and yes it works with that legacy too and will help you move to the latest container or cloud based infrastructures too.